Rock away with the best performers on the Stora Scenen and Taubescenen stages, or watch fantastic shows and performances at Rondo, Lisebergshallen Arena and Liseberg Theatre. Rock, pop, easy listening, jazz or classical music – many of Sweden’s top performers appear at Stora Scenen. The stage has also hosted greats such as Sammy Davis Jr, The Rolling Stones, Patty Smith & Her Band, and Snoop Dogg aka Snoop Lion. Didn’t see any rabbits in Rabbit Land? Then there’s a very good chance that they are hiding inside Kvarnteatern, where they perform songs and dances free for all the family. The fine old Polketten dance floor is in Liseberg’s harbour area. Many of Sweden’s top dance bands have played modern and traditional Nordic dance music here. Got two left feet? No problem, popular dance courses in jive and salsa are also offered at Polketten. 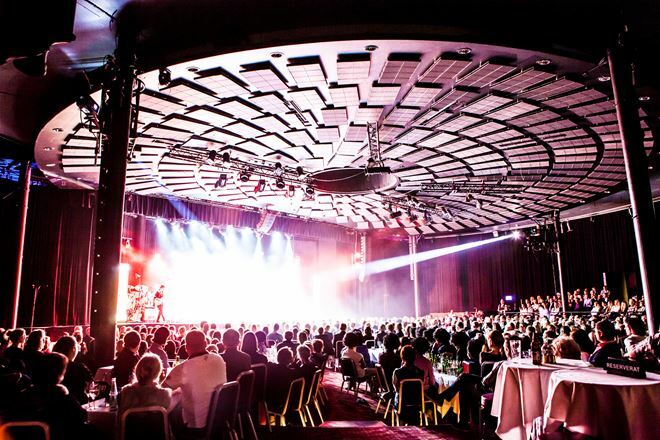 Welcome to one of Sweden’s top stages for comedies, revue acts and family performances. The walls of this classic stage are steeped in laughter. If the amusement park is open on the day you visit Lisebergsteatern (Liseberg Theatre) your ticket also gives you free admission. In summer, Taubescenen offers a diverse mix of music in an intimate setting. Punk, prog rock, pop, ballads, country, acoustic, easy listening and jazz. It covers the complete music spectrum.